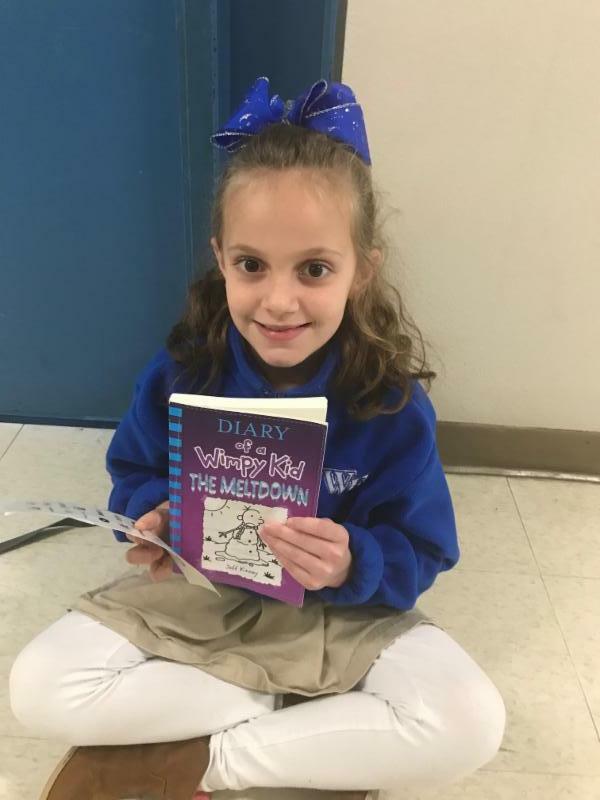 Sydnee Cutrer, WFHS Senior Cheerleader, represented West Feliciana Cheerleaders in the annual Disney Thanksgiving Parade. 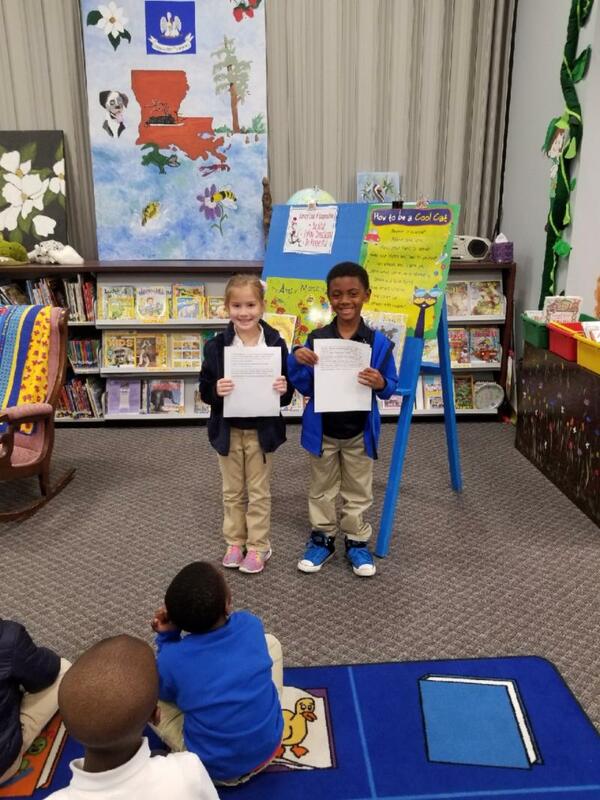 The Bains Lower Lighthouse Team elected Chloe Singleton as President and Ashton Selders as Vice President. 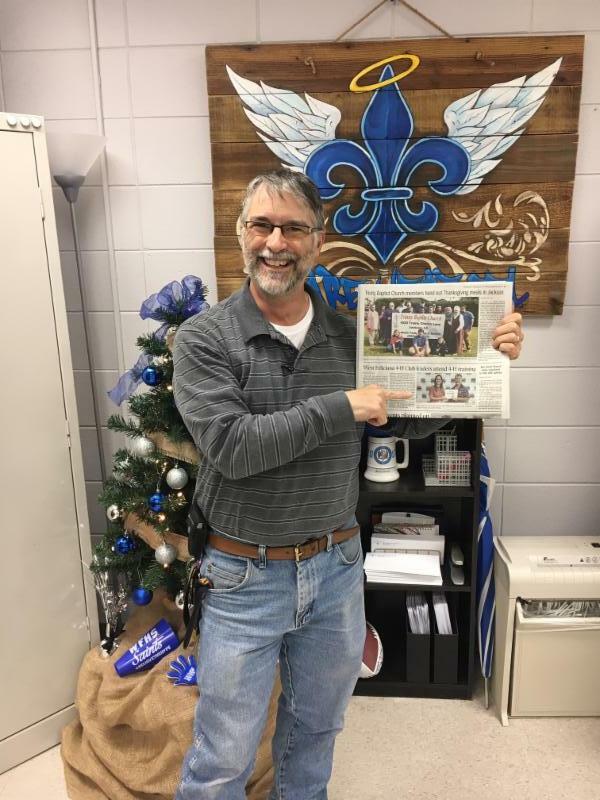 Congratulations go to our WFHS Saints Swim team for their hard work and dedication as they competed in the LHSAA State Swim Meet this week. 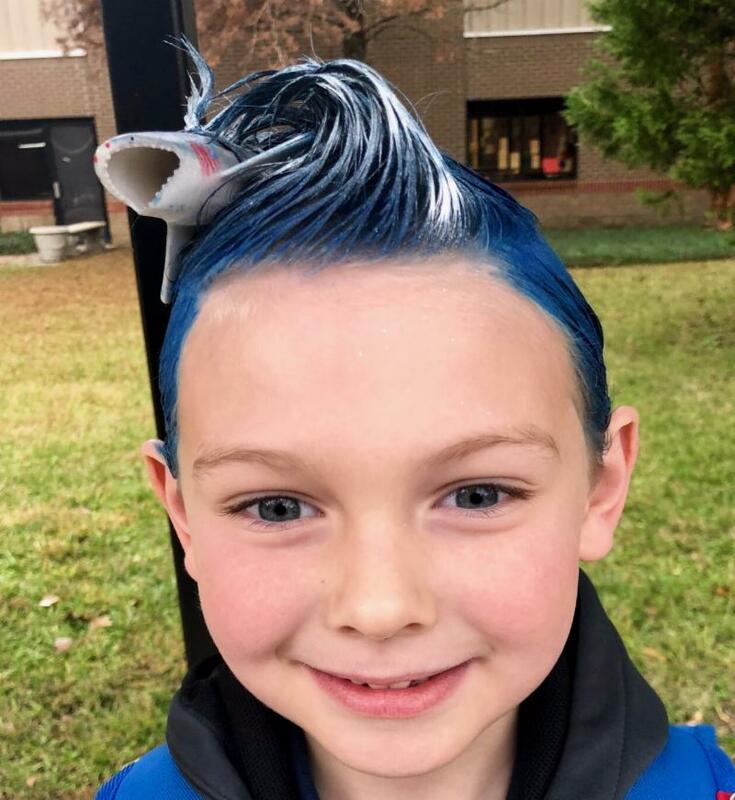 Special kudos go to the four swimmers who achieved state qualifying times that allowed them to compete individually at the meet: Reagan Edwards, Cole Dietz, Kenan Cooper, and William Ralph. 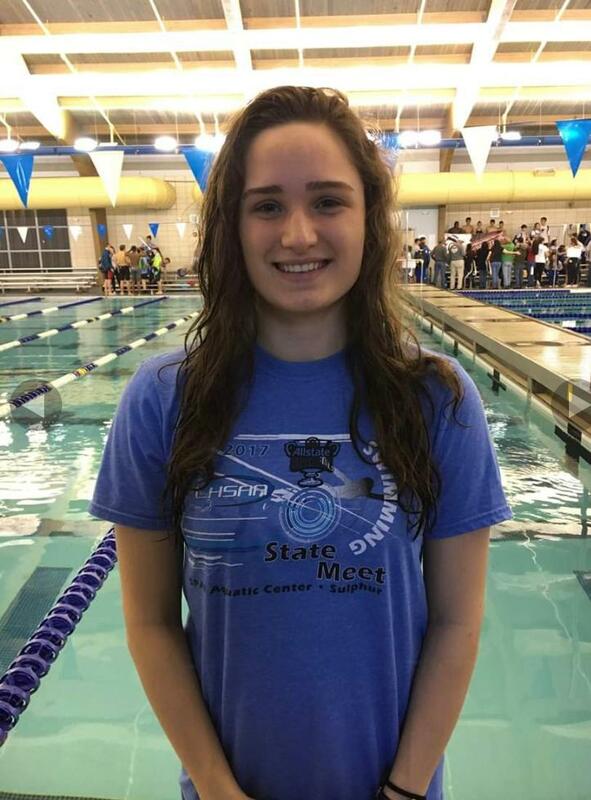 Reagan Edwards placed 6th overall in the Backstroke and 10th overall in the Butterfly. 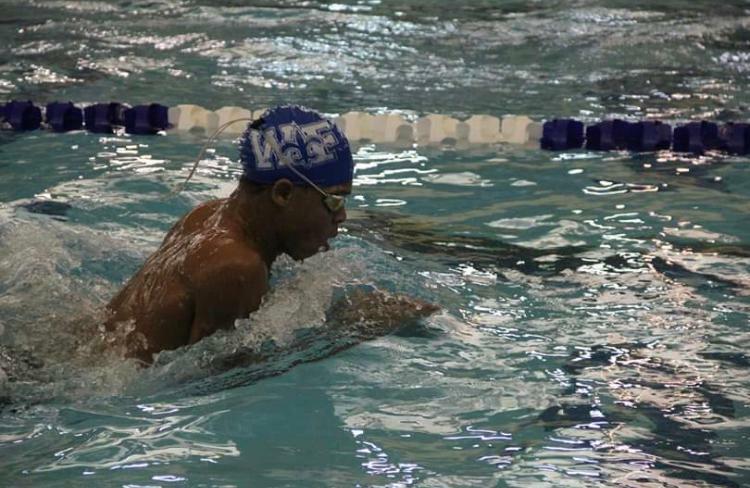 In addition, Reagan set a new West Fel record for the fastest time in the 50 yard free style as the lead swimmer in the 200 yard relay. 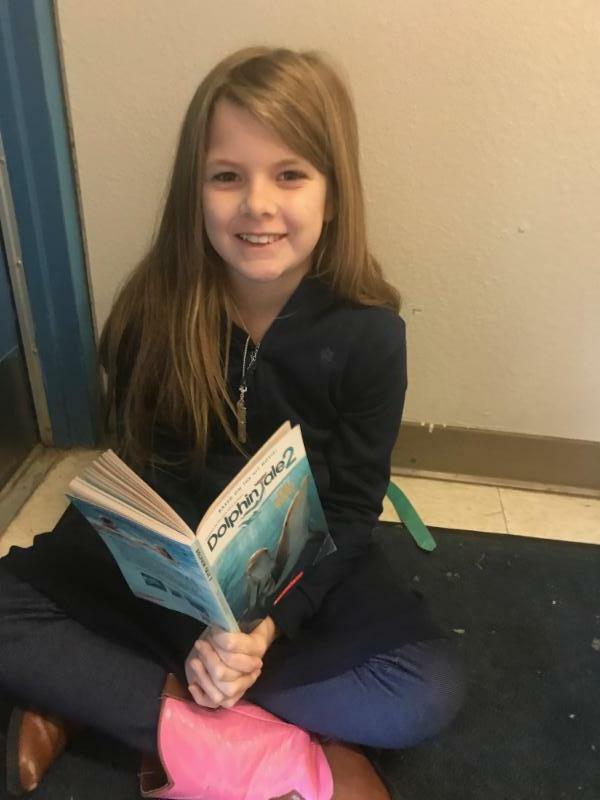 Her time was 27.75. 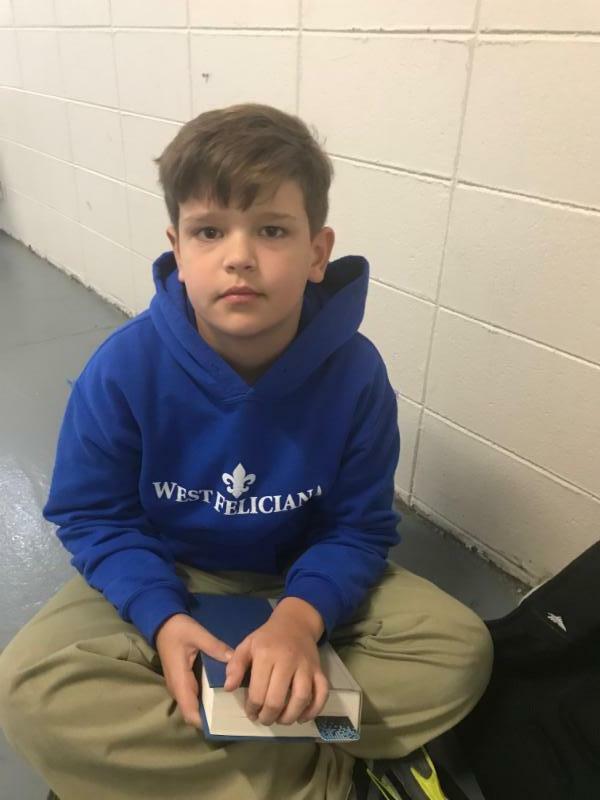 Cole Dietz competed in the 200 yard individual medley and placed 14th overall. 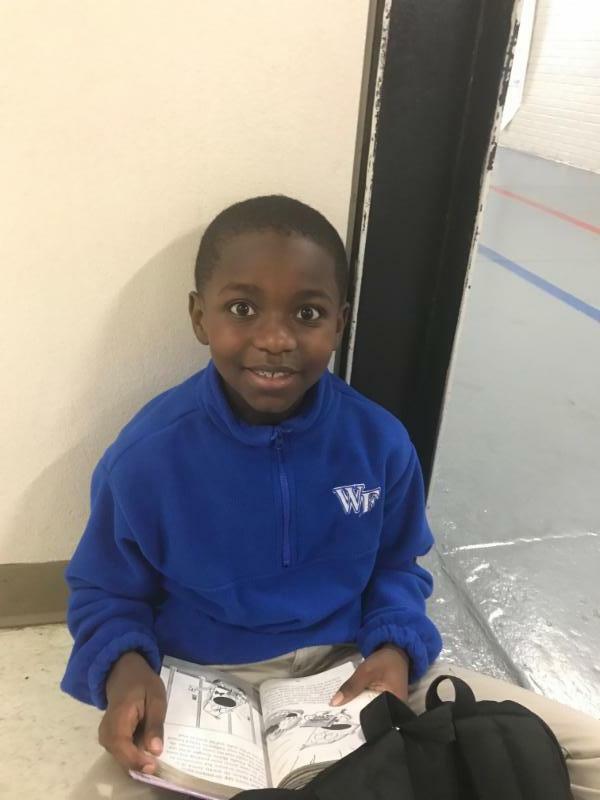 Kenan Cooper and William Ralph both competed in the 100 yard Breaststroke preliminary, with Kenan qualifying as an alternate for the finals. 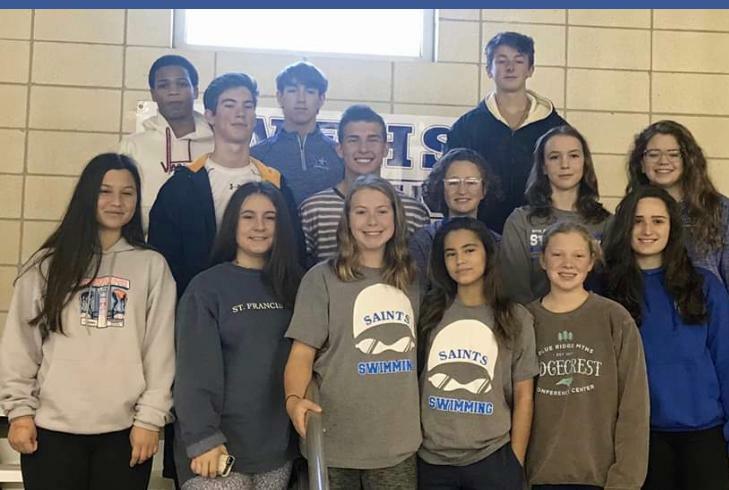 Other Saints Swimmers competing in the relays at state included Abby Benton, Kaitlyn Barrow, Victoria Gunnels, Mackenzie Bedell, Preston Shidaker, and Jack Horn. 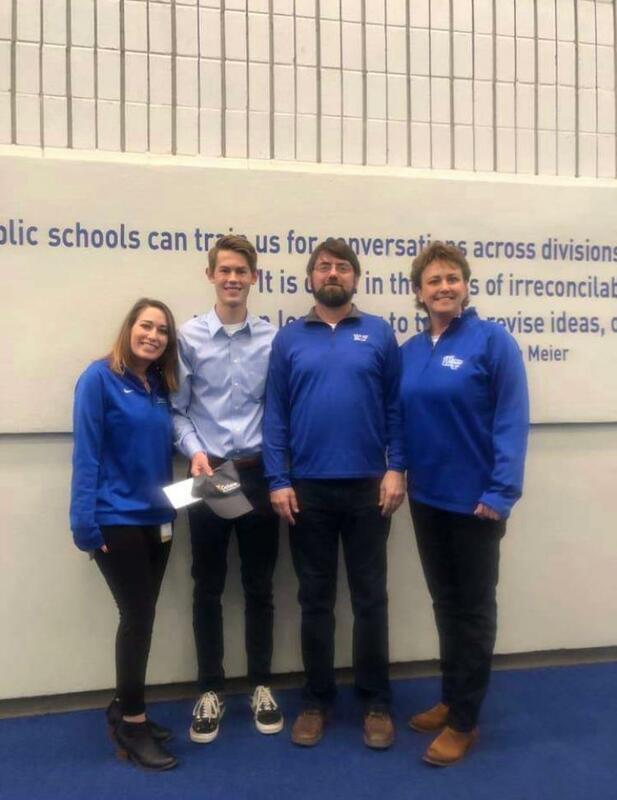 WFHS Senior Emery Godke was recognized by Ochsner's Athletic Training program with a special presentation. 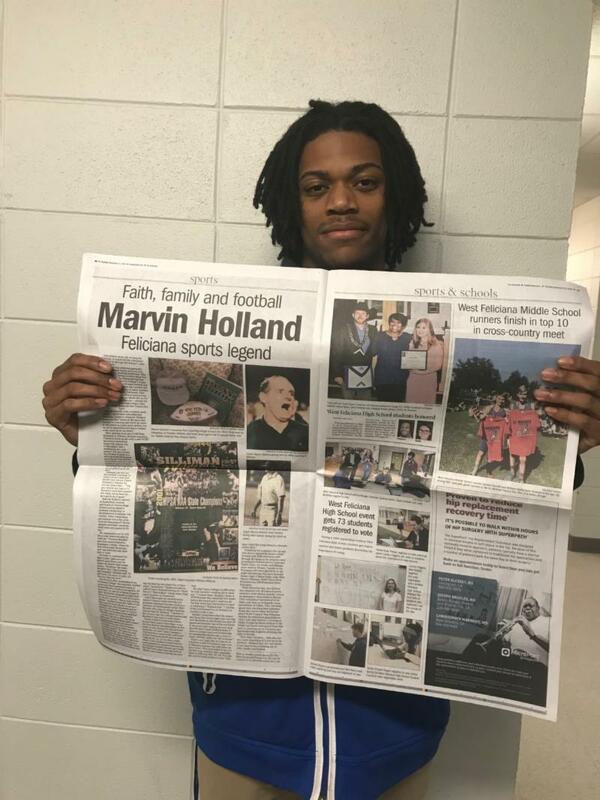 Selected by the WFHS coaching staff, Emery was recognized for his character, integrity, and leadership skills as a student-athlete. 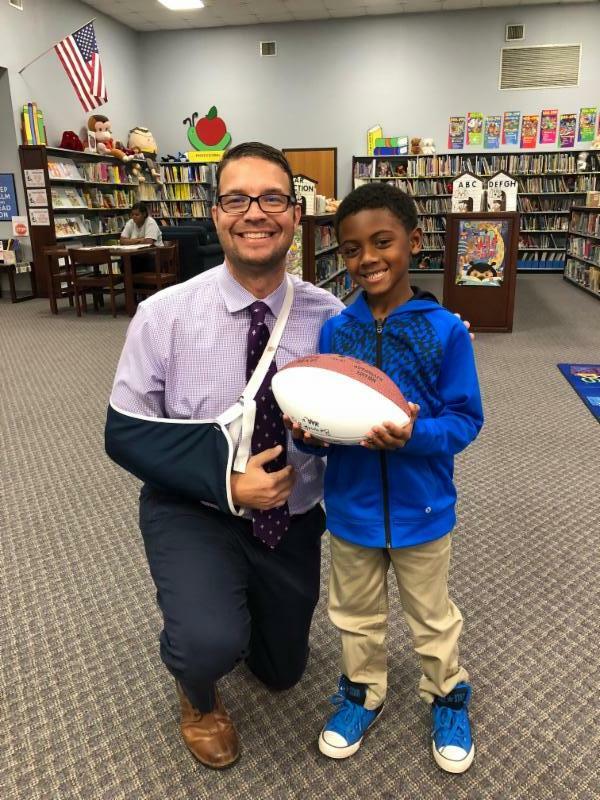 He received two New Orleans Saints tickets for an upcoming game. 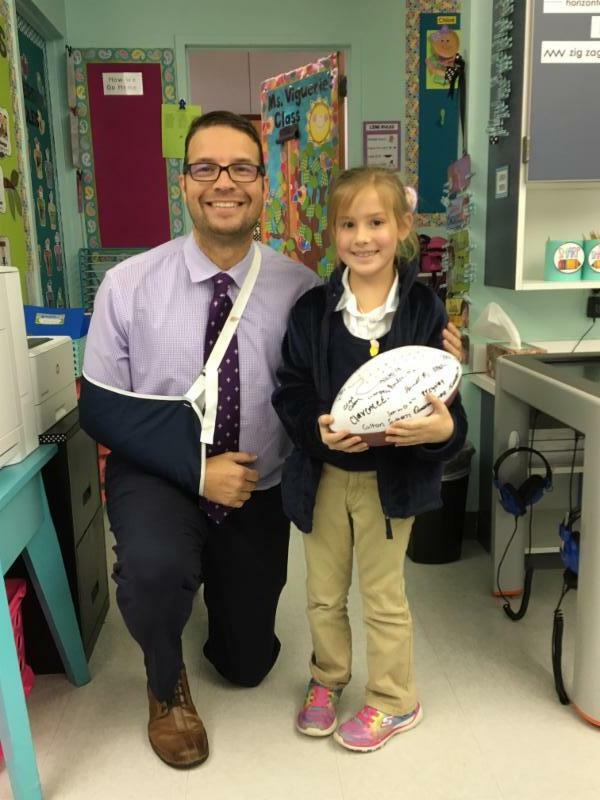 Ochsner's Athletic Trainer Supervisor Meghan Sauvic was on site to present Emery with the prestigious award. 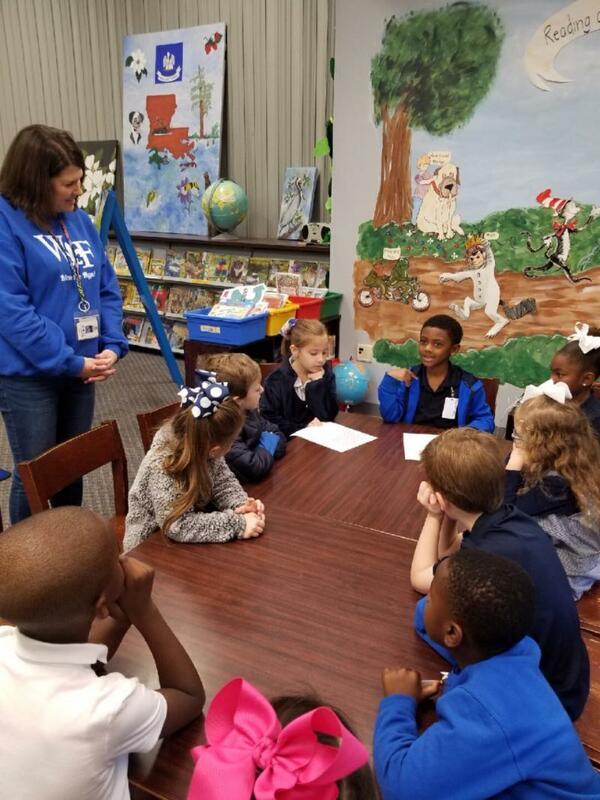 WFHS has entered into a partnership with Ochsner's Athletic Training Program in order to provide athletic training services to all our student athletes. 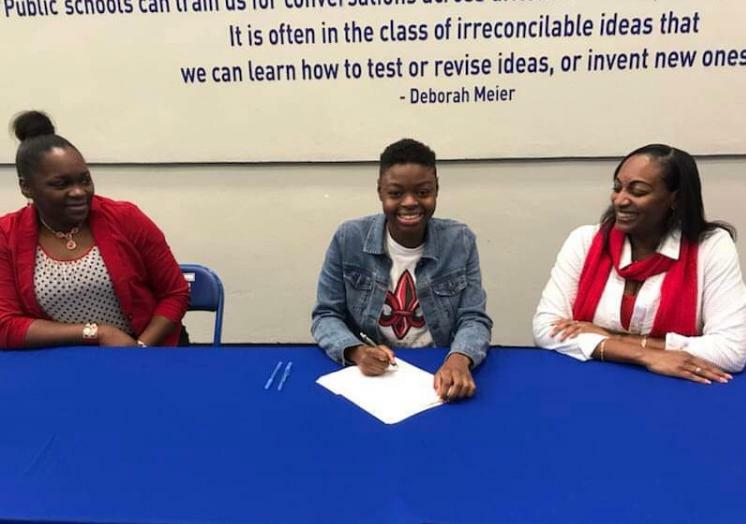 Congratulations go to Kennedy London for receiving a scholarship to the University of Louisiana Lafayette! 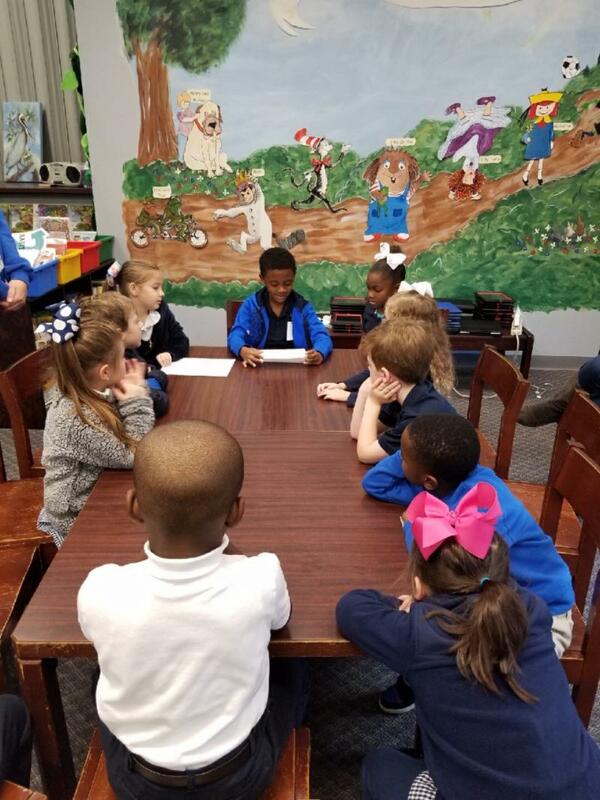 Kennedy will compete as a Ragin' Cajun with a Track and Field scholarship next year! 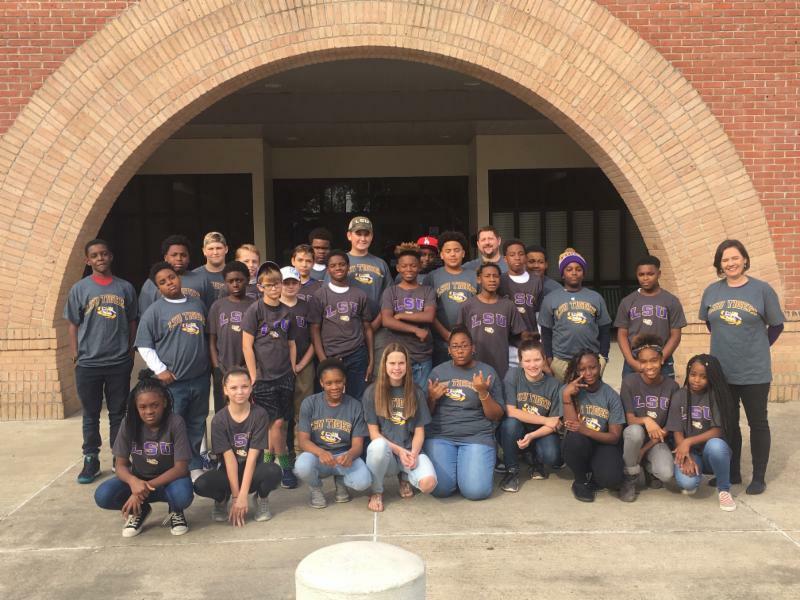 WFMS students attended an LSU football game as a reward for meeting their reading goals under the guidance of Ms. Ali McMillan. 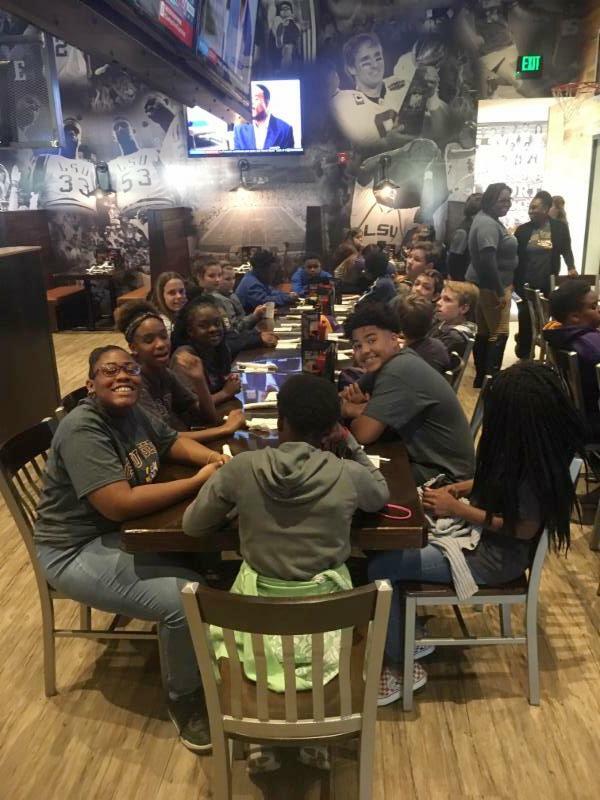 Each student received a game ticket, transportation to and from the game, a meal at Walk-Ons, and a LSU Tigers t-shirt. 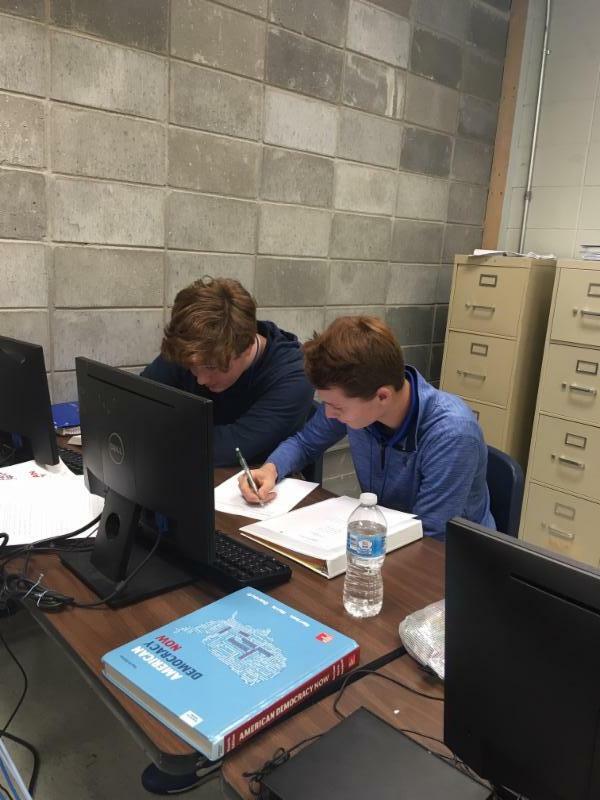 Juniors Aidan Holland and Ellis Manieri chart Civil War Battles in Mr. Max Hawkins' AP US History class. 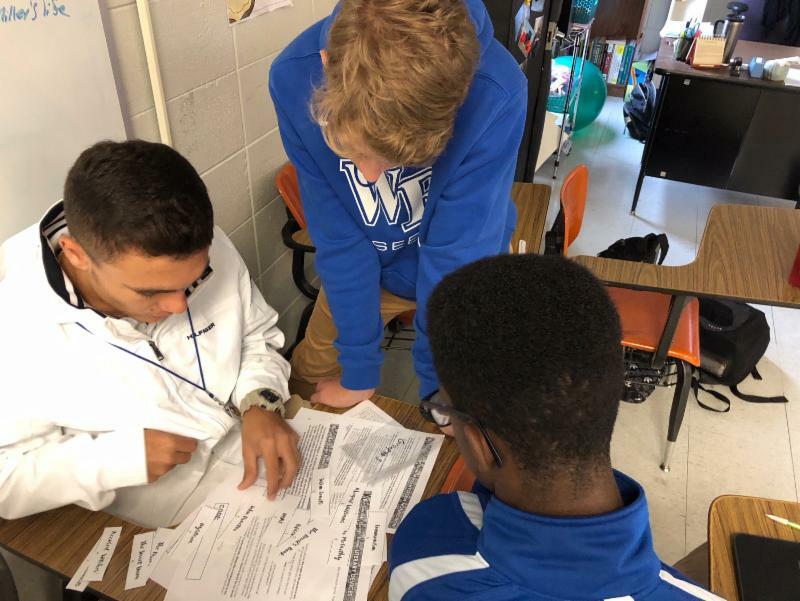 Hunter Giror, Daniel Triche, and Kendrick Whitfield identify allegorical symbols in the Crucible for Ms. Ourso's English III class. 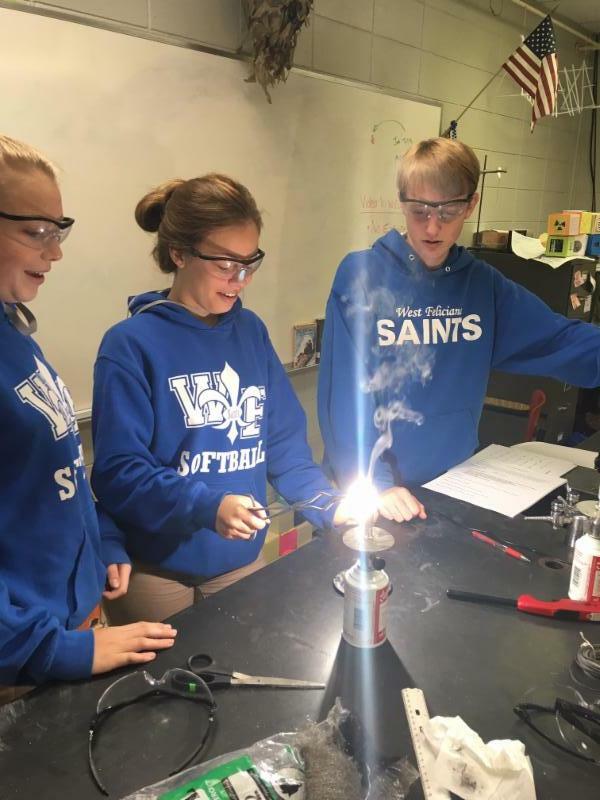 Freshmen Victoria Gunnels , Grace Felker, and Brenton Thurman experiment with oxidation reactions in Mr. Dennis Dyer's Physical Science class. 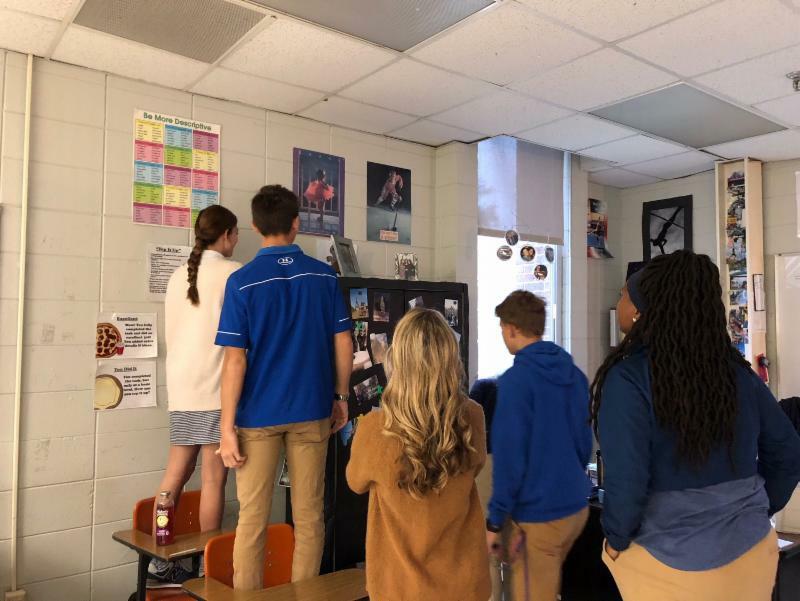 Madison Bennett, Jack Horn, Daniel Triche, Julia DeJean, and Kelsey Harris finding the next clue in the "can you escape hysteria" escape room for Ms. Ourso's activity on The Crucible. 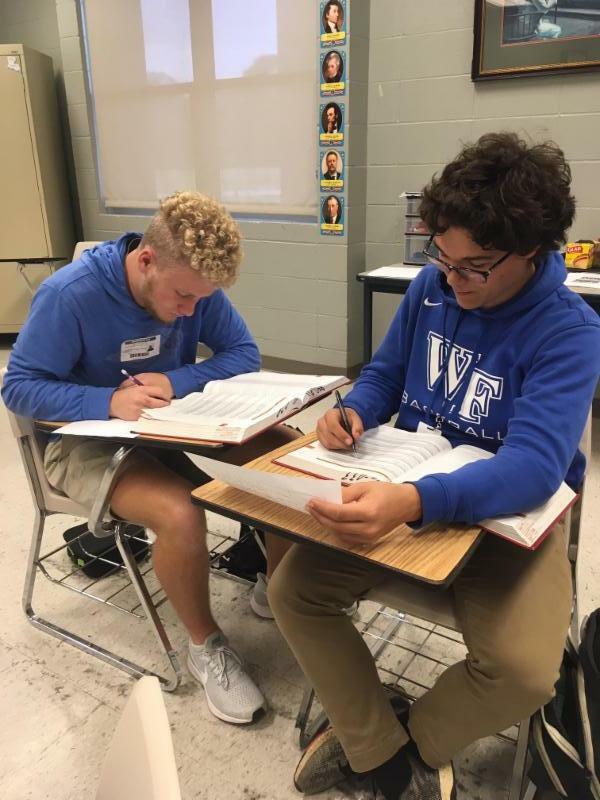 Sophomores Zane Coleman and Luke Johnston work on comprehension of historical documents in Mr. Jonathan Henslee's AP Government class. 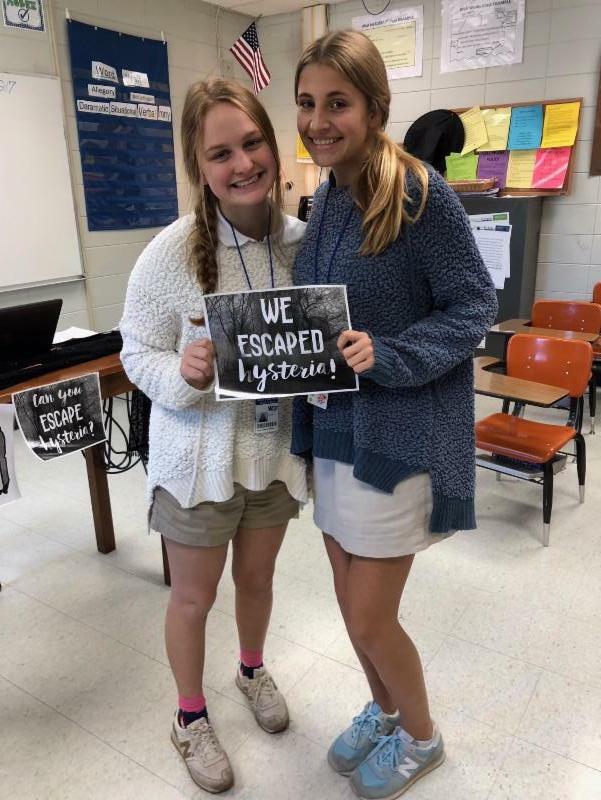 Katelyn Jones and Mary Lindsey escaped hysteria during an escape-room-themed lesson on The Crucible in Ms. Ourso's English III class. 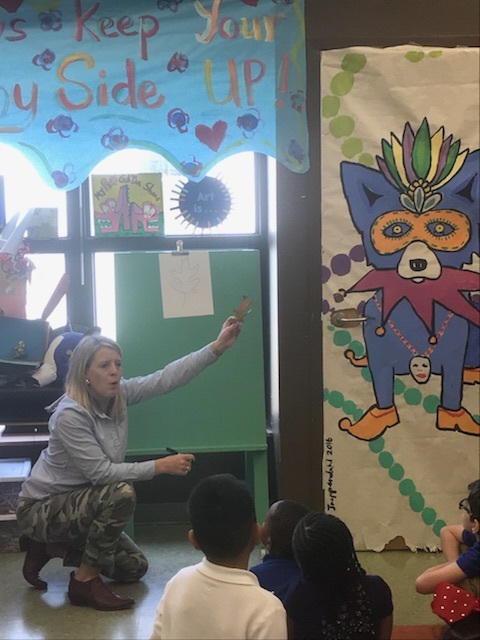 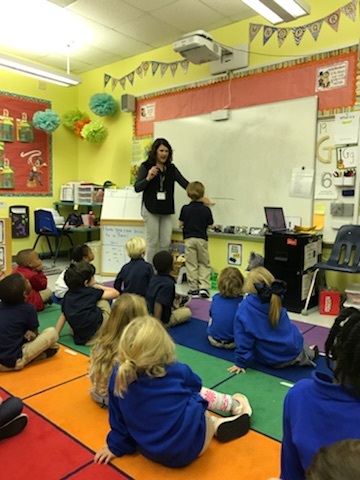 Ms. Laura Lindsey read the book "The Littlest Yellow Leaf" by Carin Berger to her First Grade art classes. 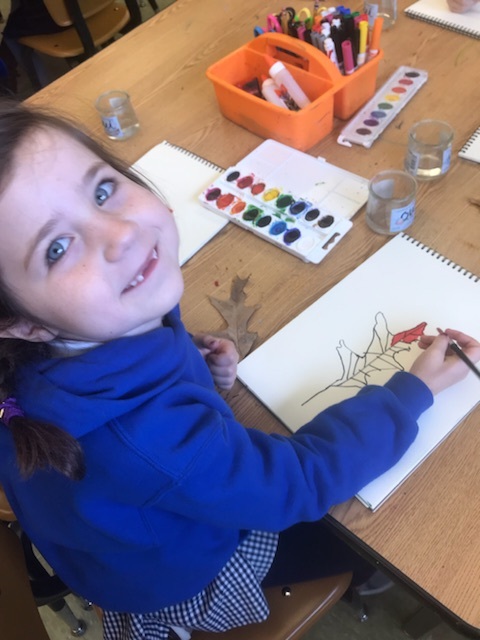 She lead a discussion about the unique characteristics of leaves as they transition from summer to fall. 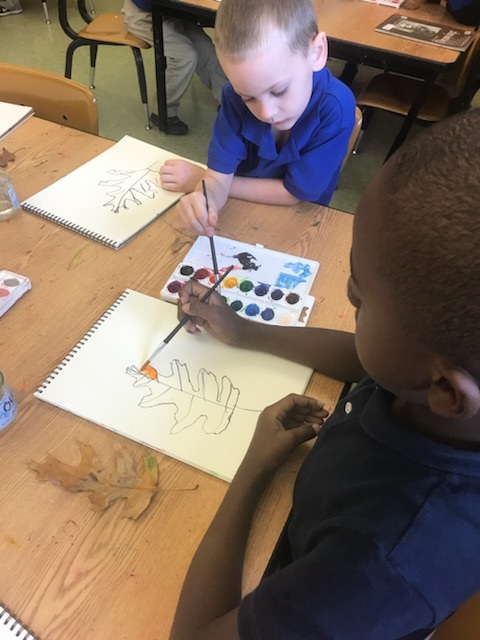 After reading the book, Mrs. Lindsey had the students select a leaf from a collection that she gathered. 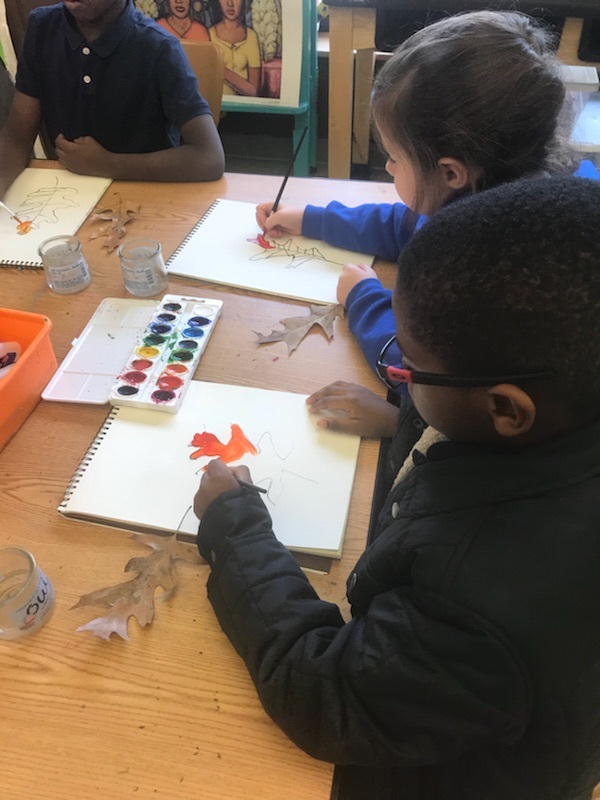 They were then given the task of tracing the leaf and watercolor painting it! 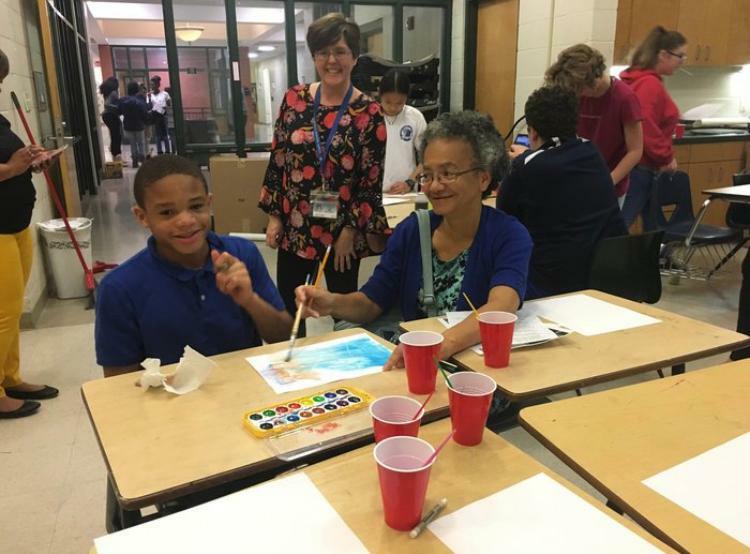 WFMS students and families had a great time at SURF night! 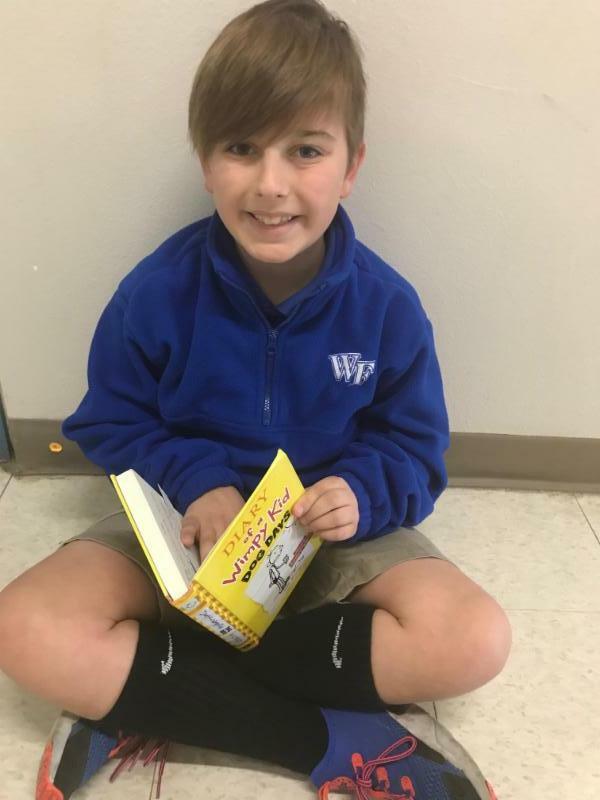 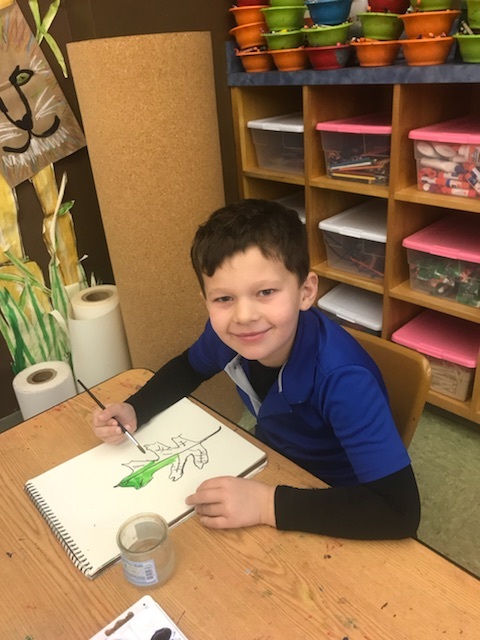 Henry Thomas James was asked to come up and complete a drawing of a triangle to share with his classmates in Ms. Liza Bryant's classroom. 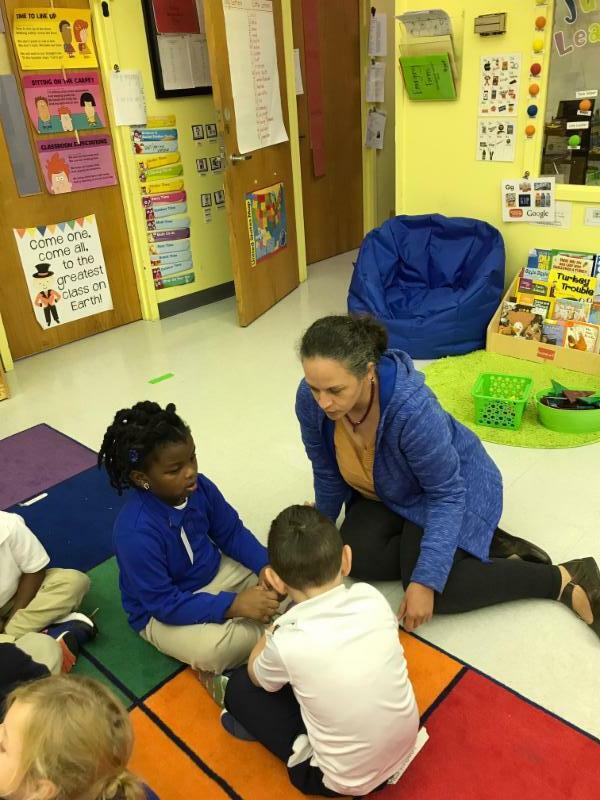 Mrs. Alex Kilcrease checks Gabrielle Tate and James Hudson Deville's understanding of triangles and their attributes while they sat and discussed during their "Knee to Knee and Eye to Eye." 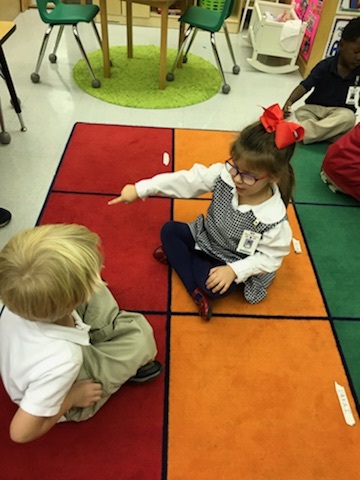 Isaac Smith and Ella Pirie sat "Knee to Knee and Eye to Eye" to discuss the attributes of triangles. 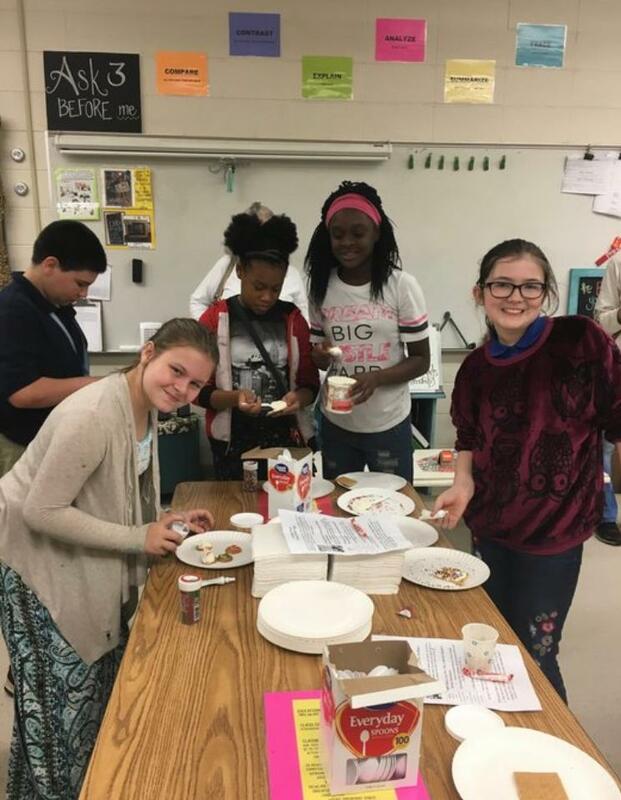 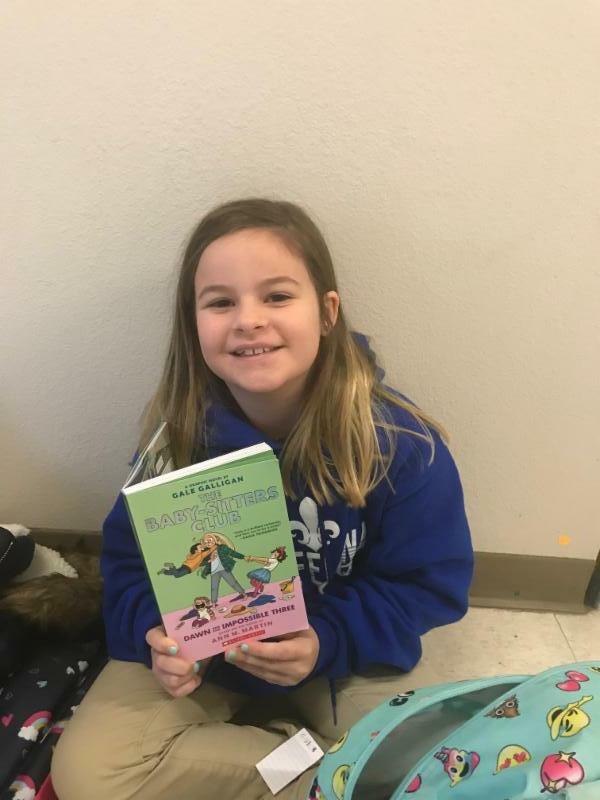 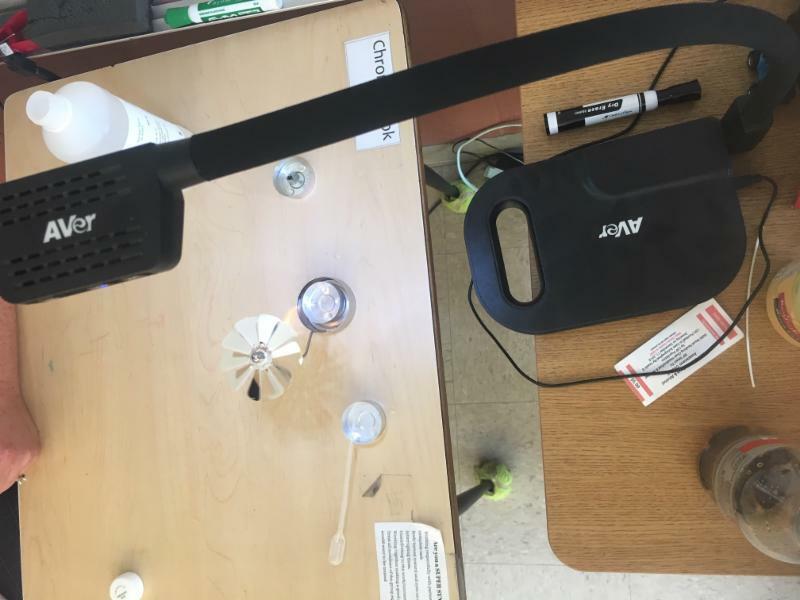 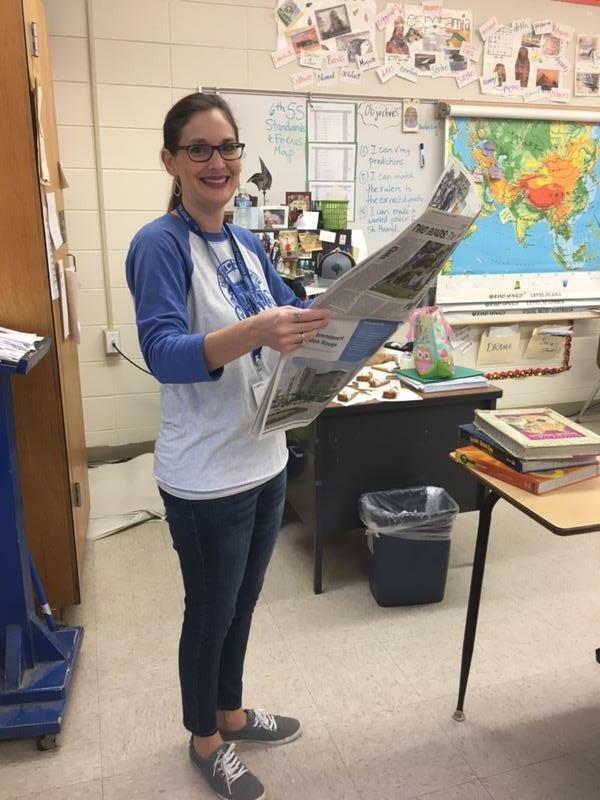 Students in Ms. Sarah Parkerson's class were challenged to create a cup that would keep hot items hot and cold items cold. 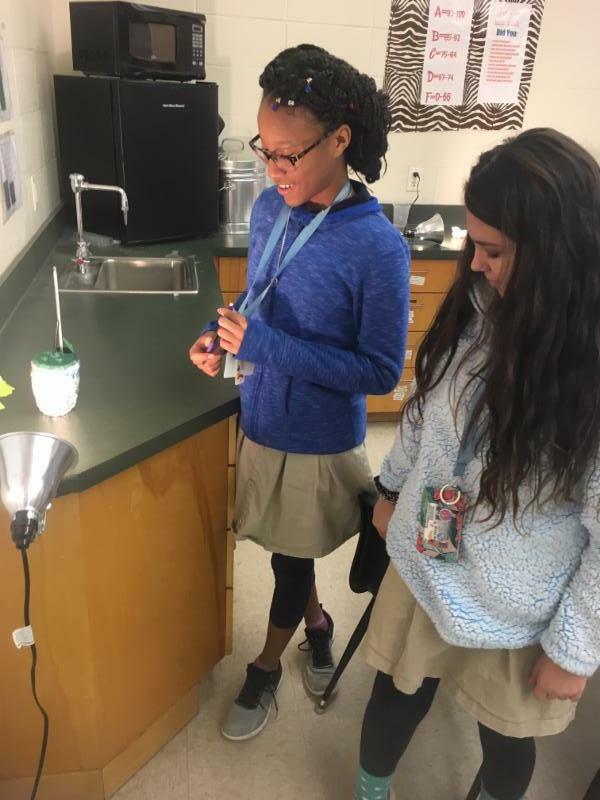 Nevaeh London and Natalie Hammack explain their cup design. 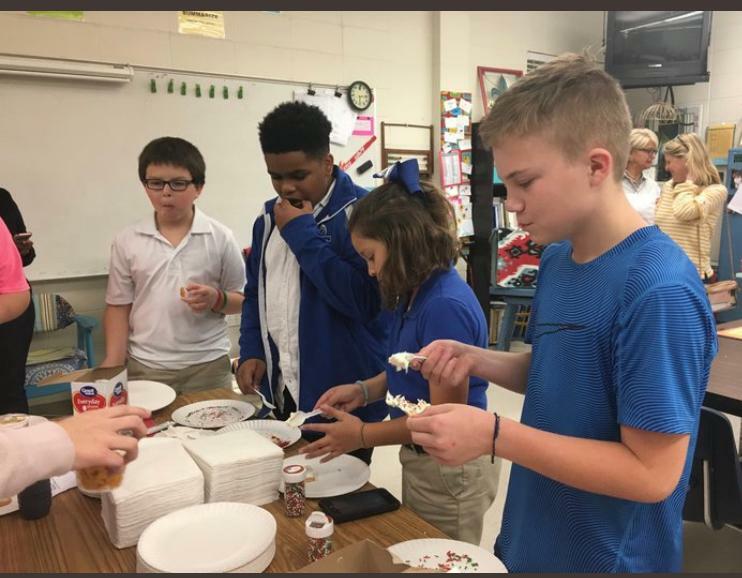 Tanner Gardner, Jack Louis, Ella Marchand, Lilly Higgins explain their cup to Mrs. Rhodes in Ms. Sarah Parkerson's class. 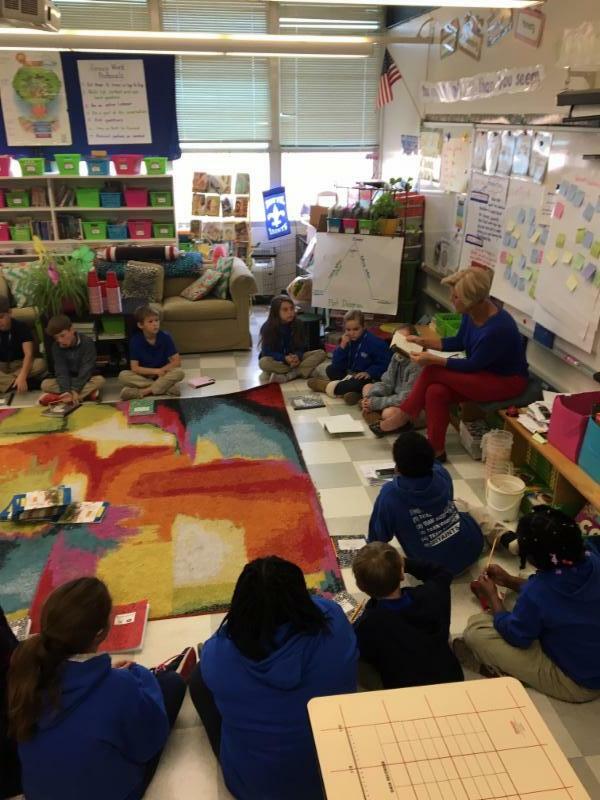 4th graders listen intently as Ms. Jean Woodside reads "Tiger Rising" by Kate DiCamillo. 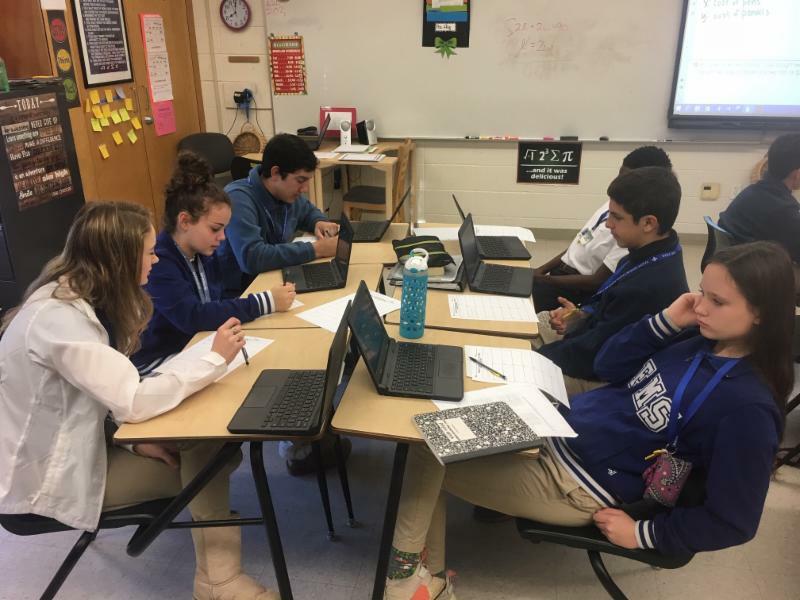 Emma Gene Fisher, Emma Cutrer, Trevor DeLee, Imani Coleman, Felipe Del Solar, and Sophie Alberstadt are working on perimeter stations in Mrs. Dyer's Algebra I class. 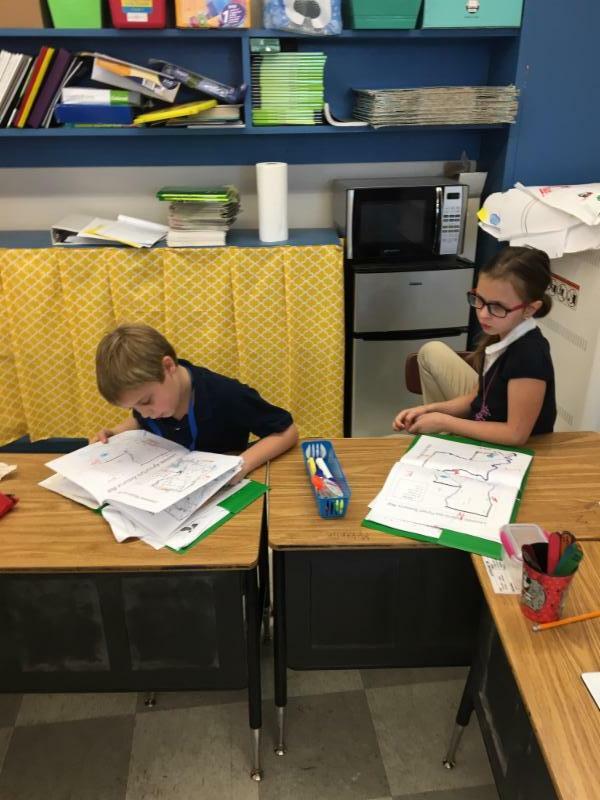 Noah Johnson and McKenzie Gore read and analyze maps in Ms. Anita Ewing and Ms. Brittney Rosenbach's class. 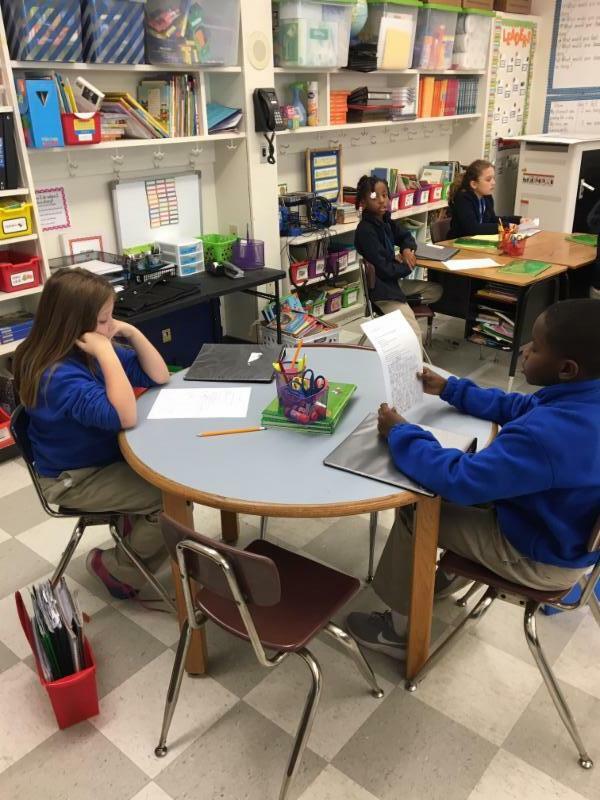 Elizabeth Marange and Jamison Parker work on the writing process in Ms. Theresa Struther's class. 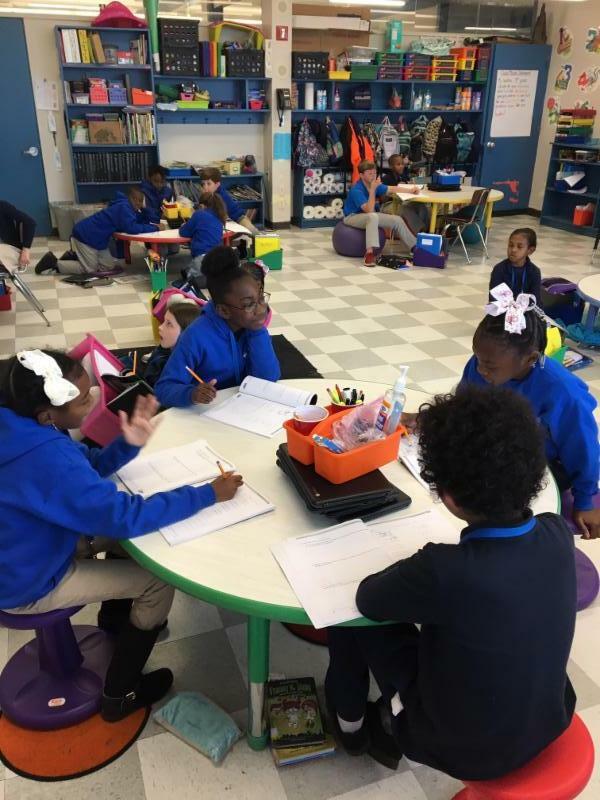 Kayla Johnson, Sa'Lacia Berry, Precious Washington, Gideon Mailhes work together to solve math problems in Ms. Darcey Walsh's class. 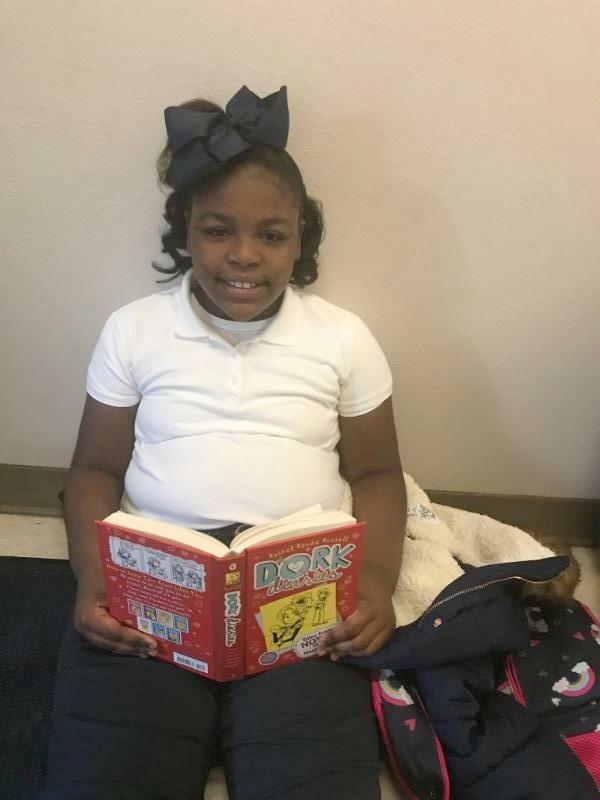 The impressive number of students at Bains and Bains Lower that read before school each morning is amazing. 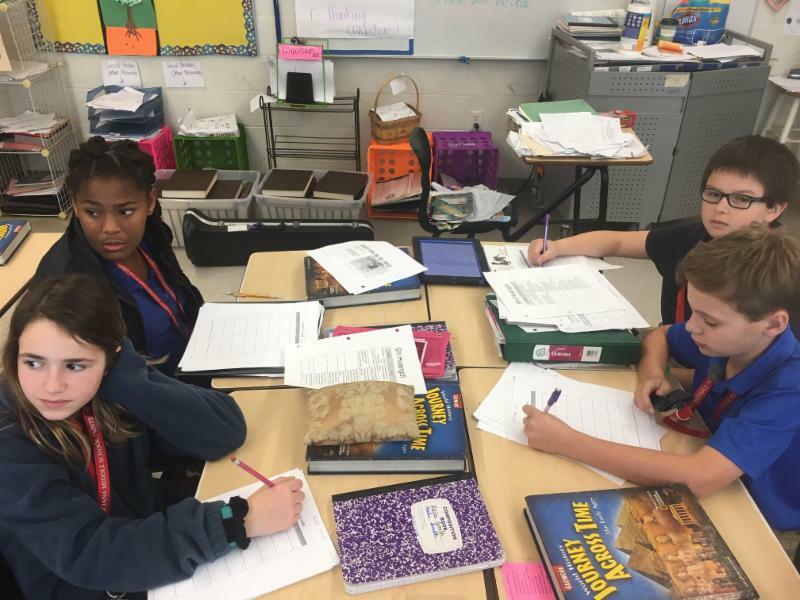 Tra'Kyria Camel, Kalin Smith, Alex Gonzalez, and Parker Major are learning about the Shi Huandi in Ms. Rogers sixth grade Social Studies class. 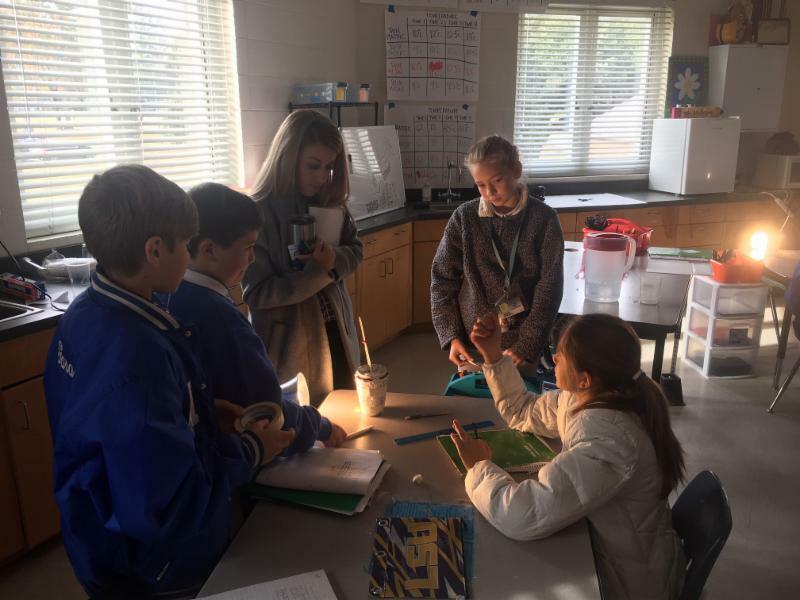 Ms. Emily Hurst is demonstrating how fuel burns and releases energy. 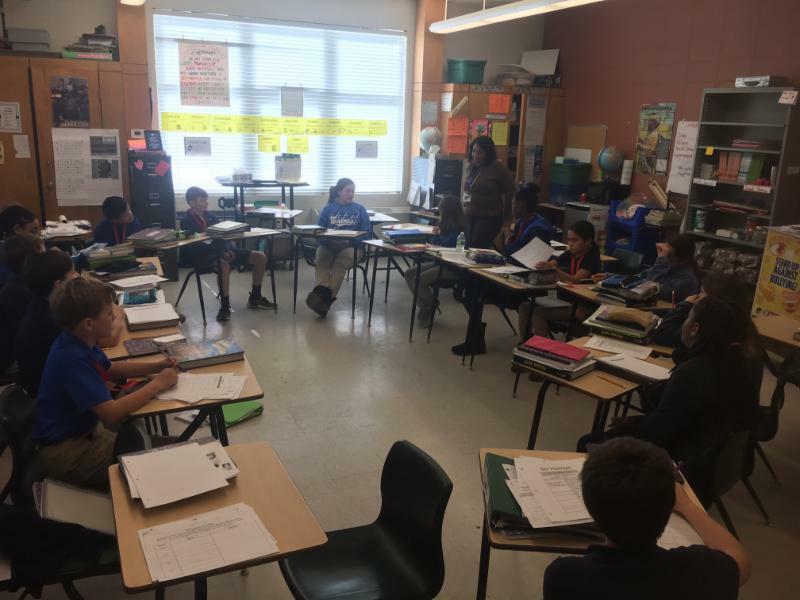 Students are working in a Socratic Circle for whole class discussion in Ms. Mary Rogers' class. 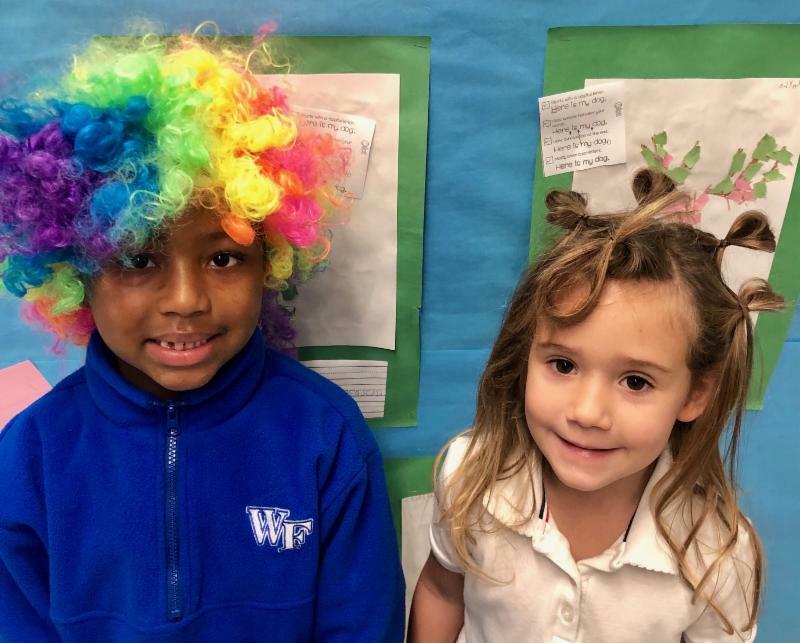 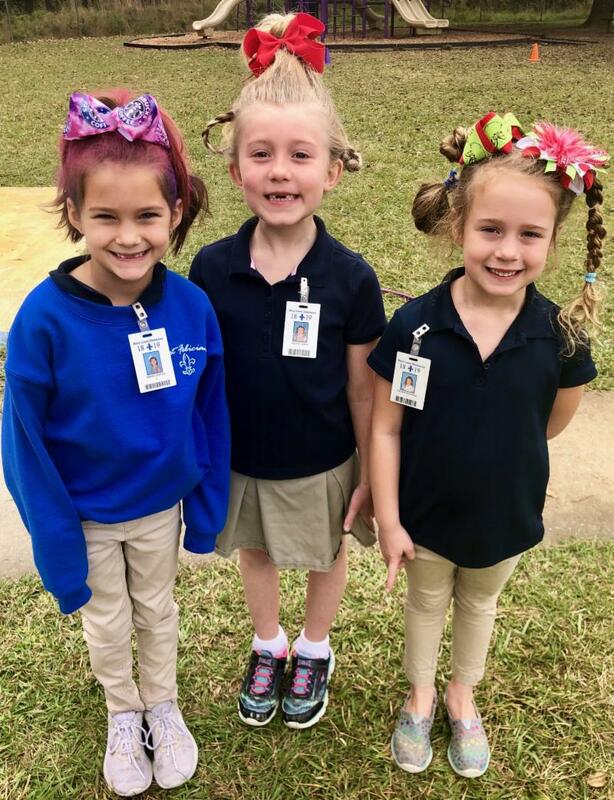 Crazy Hair Day for good behavior at Bains Lower!